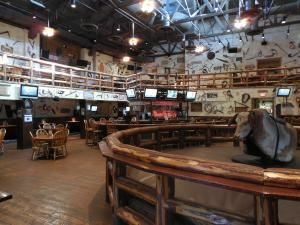 Saddle Ranch has long been host to every kind of special event including corporate gatherings, red carpet bashes, holiday parties and employee outings. We have also been host to countless commercials, television and film shoots. Some of the hottest events have taken place at Saddle Ranch. From intimate gathering to over the top bashes, casual to formal, Saddle Ranch Chop House does it all. Now sit back and let us entertain you, Saddle Ranch Style. -Open 365 days a year -For groups 20 to 420 -Semi Private room options -Menu's serving up breakfast, brunch, lunch, and dinner. -Indoor and outdoor seating. -Mechanical bull rides. -Outdoor fire pits for your guests to roast s'mores. -Friendly staff ready to serve you.